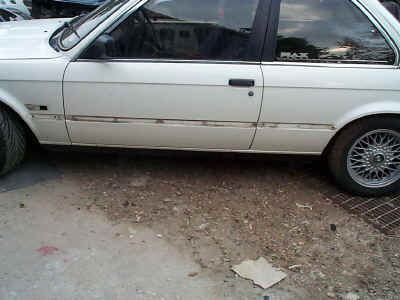 The Donor car is ready for work. 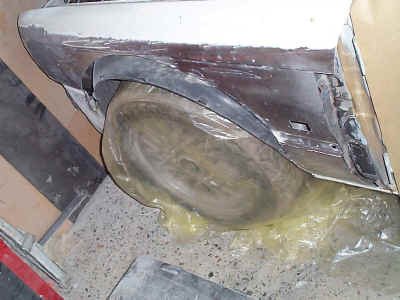 Instructions were very brief - AXE the chrome bumpers (we think he was serious about the axe part). 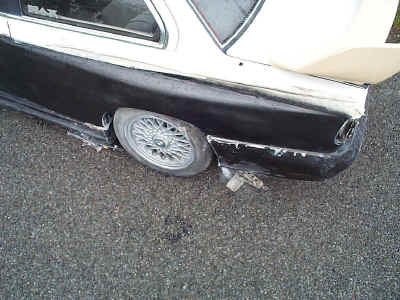 The car appears superficially solid, and after stripping only a fairly small amount of rust was found in the rear arches, and on one sill - nothing to prevent us going ahead. 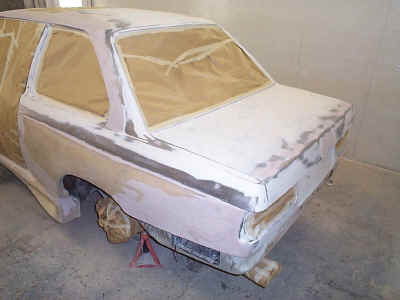 The first job is to remove the bumpers, and strip all trims, and indicators etc from the outer shell. 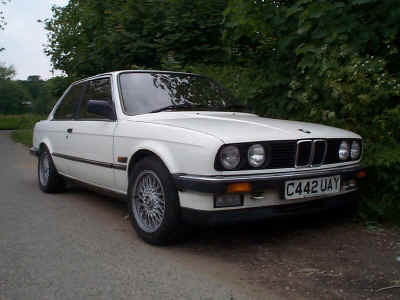 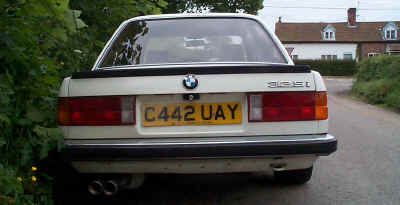 Then the car sides are waxed, and gelled as pictured below in black. 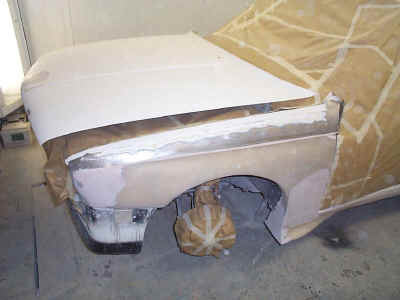 This gell is then laminated just as if we were making a bumper. 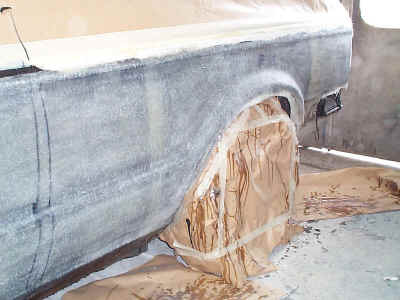 Once the fibreglass laminate has cured, we apply expanding foam to the sides of the car (not pictured) which can be very messy. 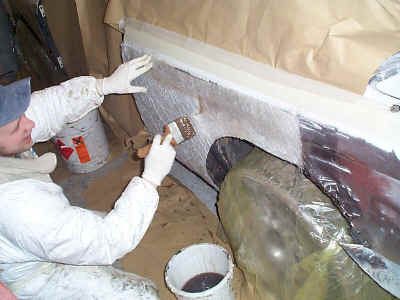 After a few days the foam is shaped as we require and then a layer of fibreglass applied over the top to stablise it, before we carry out normal filling and sanding to get the finish perfect. 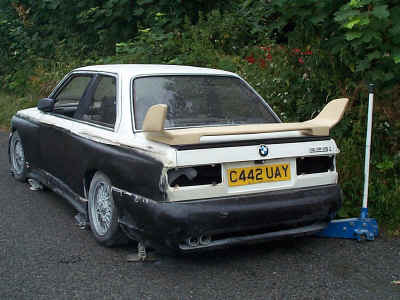 Notice above that the side panels are still in one piece. 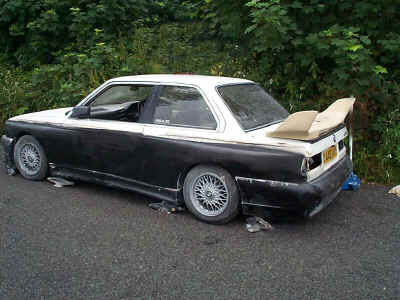 Here they are being trial fitted to check that it all looks good together. 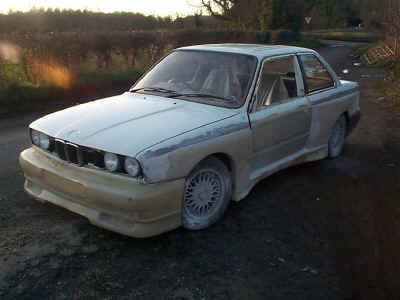 It looks as though we are nearly finished - we are only just started. 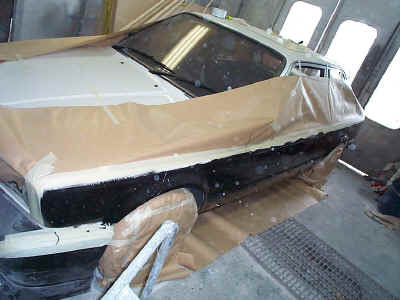 The basic shape is there, but there is a huge amount of sanding and filling to be done prior to painting the panels, which are pictured in black aerosol so that you look at the shape and not the fibreglass and filler that lies below. 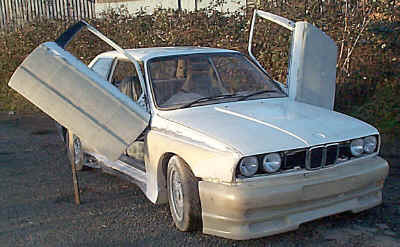 The front arch is cut back to allow for the huge wheels anticipated. 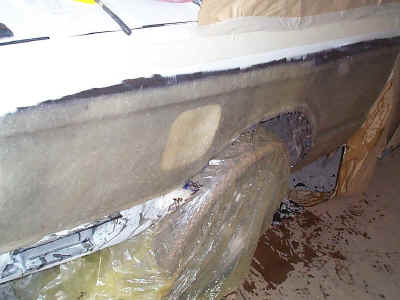 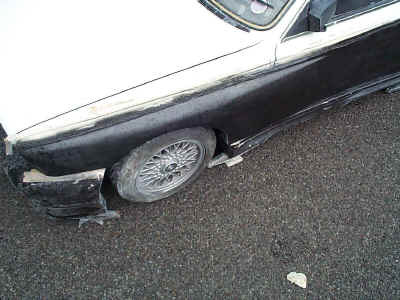 Then the paint is removed, and the side of the car laminated with fibreglass, and allowed to go off. 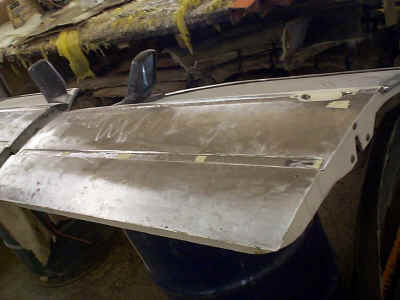 Notice the back arch has also been cut, but since it is double skinned it has been welded. 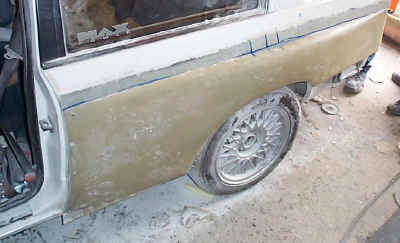 Once cured the fibreglass is sanded, and then the arch bonded over the top - don't forget to cut the filler hole out or it will be a show only car! 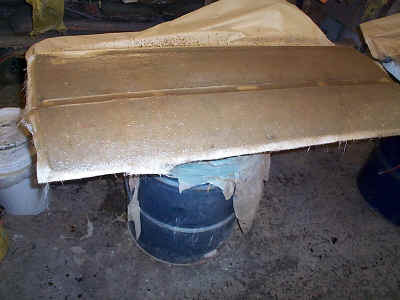 Foam injected into gap between arch and fibreglass to help durability. 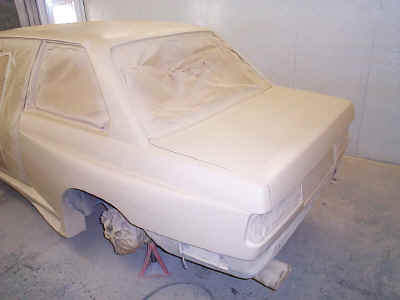 Just the bumpers, and spoiler to go, oh, then there's the sanding and filling, more sanding and filling, and then priming, and sanding, and not forgetting the preparation and painting - another 200 hours should cover it!!! 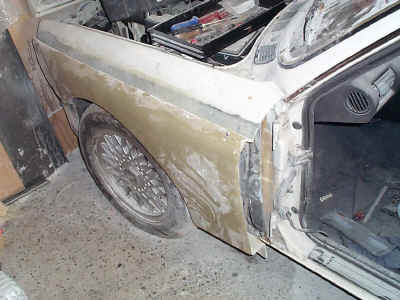 Below you can see the newly fitted gullwing doors, and the bodywork prep starts in earnest.